The term in French means "old regime" or "former regime". However, most English language books use the French term Ancien Régime. The term first appeared in print in English in 1794, and was originally pejorative in nature; Simon Schama has observed: "virtually as soon as the term was coined, 'old regime' was automatically freighted with associations of both traditionalism and senescence. It conjured up a society so encrusted with anachronisms that only a shock of great violence could free the living organism within. Institutionally torpid, economically immobile, culturally atrophied and socially stratified, this 'old regime' was incapable of self-modernization." More generally, ancien régime refers to any political and social system having the principal features of the French Ancien Régime. Europe's other anciens régimes had similar origins, but diverse fates; some eventually evolved into constitutional monarchies, whereas others were torn down by wars and revolutions. The Nine Years' War (1688–97) was a major conflict between France and a European-wide coalition of Austria and the Holy Roman Empire, the Dutch Republic, Spain, Britain, and Savoy. It was fought on the European continent and the surrounding seas, and in Ireland, North America, and India. It was the first truly global war. 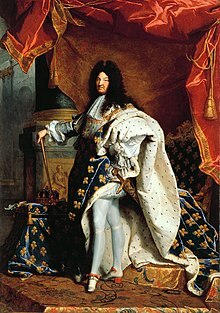 Louis XIV had emerged from the Franco-Dutch War in 1678 as the most powerful monarch in Europe, an absolute ruler who had won numerous military victories. Using a combination of aggression, annexation, and quasilegal means, Louis XIV set about extending his gains to stabilize and strengthen France's frontiers, culminating in the brief War of the Reunions (1683–84). The resulting Truce of Ratisbon guaranteed France's new borders for 20 years, but Louis XIV's subsequent actions – notably his revocation of the Edict of Nantes in 1685 – led to the deterioration of his military and political dominance. Louis XIV's decision to cross the Rhine in September 1688 was designed to extend his influence and pressure the Holy Roman Empire into accepting his territorial and dynastic claims, but when Leopold I and the German princes resolved to resist, and when the States General and William III brought the Dutch and the English into the war against France, the French King at last faced a powerful coalition aimed at curtailing his ambitions. The main fighting took place around France's borders, in the Spanish Netherlands, the Rhineland, Duchy of Savoy, and Catalonia. The fighting generally favoured Louis XIV's armies, but by 1696, his country was in the grip of an economic crisis. The Maritime Powers (England and the Dutch Republic) were also financially exhausted, and when Savoy defected from the alliance, all parties were keen for a negotiated settlement. By the terms of the Treaty of Ryswick (1697), Louis XIV retained the whole of Alsace, but he was forced to return Lorraine to its ruler and give up any gains on the right bank of the Rhine. Louis XIV also accepted William III as the rightful King of England, while the Dutch acquired their barrier fortress system in the Spanish Netherlands to help secure their own borders. However, with the ailing and childless Charles II of Spain approaching his end, a new conflict over the inheritance of the Spanish Empire would soon embroil Louis XIV and the Grand Alliance in a final war – the War of the Spanish Succession. Spain had a number of major assets, apart from its homeland itself. It controlled important territory in Europe and the New World. Spain's American colonies produced enormous quantities of silver, which were brought to Spain every few years in convoys. Spain had many weaknesses as well. Its domestic economy, possessing little business, industry, or advanced craftsmanship, was poor. It had to import practically all its weapons. Spain had a large army but it was poorly trained and poorly equipped. It had a surprisingly small navy, for seamanship was a low priority among the Spanish elites. Local and regional governments, and the local nobility, controlled most of the decision-making. The central government was quite weak, with a mediocre bureaucracy, and few able leaders. King Charles II reigned 1665 to 1700, but he was in very poor physical and mental health. As King Charles II had no children, the question of who would succeed to the Spanish throne unleashed a major war. The Vienna-based Habsburg family, of which Charles II was a member, proposed its own candidate for the throne. However the Bourbons, the ruling family of France, instinctively opposed expansions of Habsburg power within Europe and also had a candidate: Philip, the grandson of powerful King Louis XIV. Spain's silver, and its inability to protect its assets, made it a highly visible target for ambitious Europeans. For generations, Englishmen had contemplated capturing the Spanish treasure fleet, a feat that had only been accomplished once, in 1628, by the Dutch. English mariners nevertheless seriously pursued the opportunities for plunder and trade in Spain's colonies. As he neared his death, Charles II bequeathed his throne to the Bourbon candidate, the future Philip V of Spain. His grandfather, Louis XIV, eagerly endorsed the choice and made unilateral, aggressive moves to safeguard the viability of his family's new possessions, such as moving the French army into the Spanish Netherlands, and securing exclusive trading rights for the French in Spanish America. However, a coalition of enemies, opposed to this rapid expansion of French power, quickly formed, and a major European war broke out 1701-1714. From the perspective of France's enemies, the notion of France gaining enormous strength by taking over Spain and all its European and overseas possessions was anathema. Furthermore, the prospect of dividing up Spanish holdings, especially its vast colonial possessions in the New World, proved very attractive. France's enemies formed a Grand Alliance, led by the Holy Roman Empire's Leopold I. It included Prussia and most of the other German states, The Netherlands, Portugal, Savoy (in Italy) and—most significantly—England. The opposing alliance, for its part, consisted primarily of France and Spain, but also included a few smaller German princes and dukes in Italy. Extensive, back-and-forth fighting took place in the Netherlands. However, the dimensions of the war once again changed when both Emperor Leopold and his son and successor, Joseph, died, leaving his brother Charles as both the Alliance candidate for king of Spain and Holy Roman Emperor. Given that such a union between Spain and the Holy Roman Empire would, in the eyes of Charles VI's allies, be too powerful, most of the allies quickly concluded a separate peace with France. After another year of fruitless campaigning, Charles VI would do the same, abandoning his desire to become the king of Spain. The Treaty of Utrecht in 1713 resolved all of the issues. France gave up Newfoundland and Nova Scotia ( in modern-day Canada). Louis' grandson became Philip V, king of Spain, and kept all its overseas colonies, but renounced any rights to the French throne. Spain lost its European holdings outside the homeland itself. The former members of the alliance, too, profited from the war; the United Provinces had maintained its independence in the face of French aggression; the Habsburgs had picked up territory north of Austria and in Italy, including the erstwhile Spanish Netherlands and Naples; but the greatest beneficiary of the war was Britain, which, in addition to extensive extra-European territorial gains made at the expense of Spain and France, also established further checks to French expansion within the continent by moderately strengthening its European allies. The quarter century after the Treaty of Utrecht was a peaceful, with no major wars, and only a few secondary military episodes of minor importance. The main powers had exhausted themselves in warfare, with many deaths, disabled veterans, ruined navies, high pension costs, heavy loans and high taxes. In 1683 indirect taxes had brought in 118,000,000 livres; by 1714 they had plunged to only 46,000,000. Louis XIV, with his eagerness for warfare, was gone, replaced by a small sickly child who was the last Bourbon survivor, and his death had the potential to throw France into another round of warfare. He was Louis XV and he lived until the 1770s. France's main foreign policy decision-maker was Cardinal Fleury. He recognized that France needed to rebuild, so he pursued a peace policy. France had a poorly designed taxation system, whereby tax farmers kept much of the money, and the treasury was always short. The banking system in Paris was undeveloped, and the treasury was forced to borrow at very high interest rates. London's financial system proved strikingly competent in funding not only the English forces, but its allies as well. Queen Anne was dead, and her re-successor King George I was a Hanoverian who moved his court to London, but never learned English and surrounded himself with German advisors. They spent much of their time and most of their attention on Hanoverian affairs. He too was threatened by instability of the throne, for the Stuart pretenders, long supported by King Louis XIV, threatened repeatedly to invade through Ireland or Scotland, and had significant internal support from the Tory faction. However Sir Robert Walpole was the dominant decision-maker, 1722-1740, although the role was not yet called prime minister. Walpole strongly rejected militaristic options, and promoted a peace program. He and Cardinal Fleury agreed, and signed an alliance. The Netherlands was much reduced in power, and followed along with England. In Vienna, Austria (formally the Holy Roman Empire) the Habsburg emperors were bickering with the new Bourbon King of Spain, Philip V, over Habsburg control of most of Italy. Relations with France therefore were undramatic. 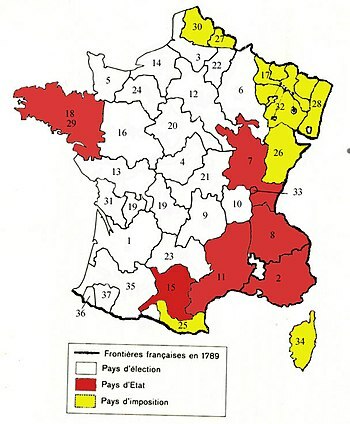 In addition, certain provinces within France were ostensibly personal fiefs of noble families (notably the Bourbonnais, Forez and Auvergne provinces held by the House of Bourbon until the provinces were forcibly integrated into the royal domain in 1527 after the fall of Charles III, Duke of Bourbon). Treaty of Westphalia (1648) – cities of the Décapole in Alsace and de jure "Trois-Evêchés"
In the 16th century, the kings of France, in an effort to exert more direct control over royal finances and to circumvent the double-board (accused of poor oversight) – instituted numerous administrative reforms, including the restructuring of the financial administration and an increase in the number of "généralités". 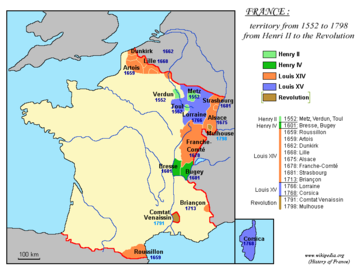 In 1542, Henry II, [Francis was still king in 1542] France was divided into 16 "généralités". 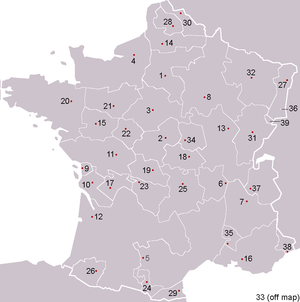 The number increased to 21 at the end of the 16th century, and to 36 at the time of the French Revolution; the last two were created in 1784. In an effort to increase revenues, the state often turned to the creation of new offices. Before it was made illegal in 1521, it had been possible to leave open-ended the date that the transfer of title was to take effect. In 1534, the "forty days rule" was instituted (adapted from church practice), which made the successor's right void if the preceding office holder died within forty days of the transfer and the office returned to the state; however, a new fee, called the survivance jouissante protected against the forty days rule. In 1604, Sully created a new tax, the "paulette" or "annual tax" (1/60 of the amount of the official charge), which permitted the title-holder to be free of the 40-day rule. The "paulette" and the venality of offices became key concerns in the parliamentarian revolts of the 1640s (La Fronde). First Minister: ministers and secretaries of state – such as Sully, Concini (who was also governor of several provinces), Richelieu, Mazarin, Jean-Baptiste Colbert, Cardinal de Fleury, Turgot, etc. – exerted a powerful control over state administration in the 17th and 18th century. The title "principal ministre de l'état" was however only given six times in this period and Louis XIV himself refused to choose a "prime minister" after the death of Mazarin. Royal administration in the provinces had been the role of the bailliages and sénéchaussées in the Middle Ages, but this declined in the early modern period, and by the end of the 18th century, the bailliages served only a judicial function. 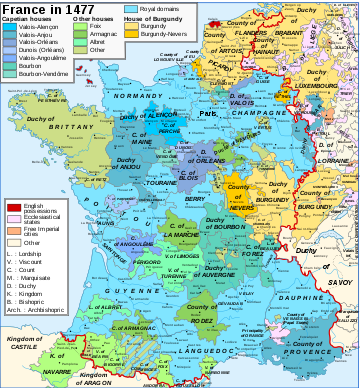 The main source of royal administrative power in the provinces in the 16th and early 17th centuries fell to the gouverneurs (who represented "the presence of the king in his province"), positions which had long been held by only the highest ranked families in the realm. With the civil wars of the early modern period, the king increasing turned to more tractable and subservient emissaries, and this was the reason for the growth of the provincial intendants under Louis XIII and Louis XIV. Indendants were chosen from among the maître des requêtes. Intendants attached to a province had jurisdiction over finances, justice, and policing. The main provisions of the Edict of Nantes (1598), which Henry IV had issued as a charter of religious freedoms for the Huguenots, were as follows; firstly Huguenots were allowed to hold religious services in certain towns in each province; secondly they were allowed to control and fortify eight cities; thirdly special courts were established to try Huguenot offenders; fourthly Huguenots were to have equal civil rights with the Catholics. By the 1780s, Protestants comprised about 700,000 people, or 2% of the population. Theirs was no longer a favorite religion of the elite; most Protestants were peasants. To be a Protestant was still illegal. Although the law was seldom enforced it could be a threat or a nuisance to Protestants. Calvinists lived primarily in the Midi; about 200,000 Lutherans lived in Alsace, where the 1648 Treaty of Westphalia still protected them. Political power was widely dispersed among certain elites. The law courts ("Parlements") were powerful, especially that of France. However, the king had only about 10,000 officials in royal service — very few indeed for such a large country, and with very slow internal communications over an inadequate road system. Travel was usually faster by ocean ship or river boat. The different estates of the realm – the clergy, the nobility, and commoners – occasionally met together in the "Estates General", but in practice the Estates General had no power, for it could petition the king but not pass laws itself. Accepting the existence of these two societies, the constant tension between them, and extensive geographic and social mobility tied to a market economy holds the key to a clearer understanding of the evolution of the social structure, economy, and even political system of early modern France. Collins (1991) argues that the Annales School paradigm underestimated the role of the market economy; failed to explain the nature of capital investment in the rural economy; and grossly exaggerated social stability. 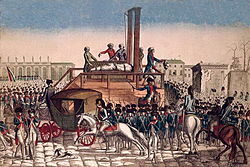 The demands by peasants played a major in fashioning the early stages of the French Revolution in 1789. The role of women has recently received attention, especially regarding their religiosity. ^ Schama, Simon (1989). Citizens: A Chronicle of the French Revolution. New York: Alfred A. Knopf. p. 184. ^ Shinsuke Satsuma (2013). Britain and Colonial Maritime War in the Early Eighteenth Century: Silver, Seapower and the Atlantic. pp. 1–2. ^ William Stearns Davis (1919). 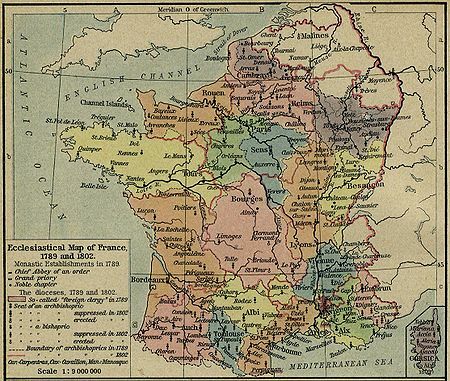 A History of France from the Earliest Times to the Treaty of Versailles. p. 193. ^ Bély 1994, p. 21. In 1492, roughly 450,000 km2 versus 550,000 km2 today. 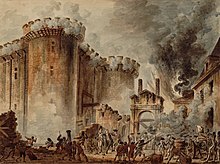 ^ The Origins of the French Revolution. Historyguide.org (2006-10-30). Retrieved on 2011-11-18. This page was last edited on 17 April 2019, at 01:40 (UTC).